as well as the expansion of sharing culture. 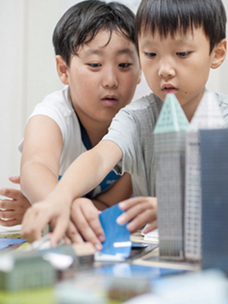 For this year, the fourth Dream Building Creativity School is scheduled to be operated for 200 middle and high school students with dreams in five sectors, including music, musical, fashion, cooking and film, for five months from early August. In particular, the fourth school has expanded its level of support from local childcare centers to schools subject to education welfare priority support programs, alternative schools and local youth training centers. Employee and university student mentors, as well as external expert mentors! The most important point of the Dream Building Creativity School is that various members of society, including university students and leading industry experts, in addition to CJ Group’s internal experts, participate as mentors to provide many-sided and practical mentoring. Those members engage in five cultural industries preferred by teenagers for jobs in the future. At first, employees of CJ CheilJedang, CJ Foodville, CJ O Shopping, CJ E&M and CJ CGV planned to lead onsite visits to the workplace and undertake practice classes. University student mentors selected in the contest will make a weekly visit to related organizations to provide mentoring for creating cultural products. While CJ employees offer more professional training based on their business knowledge, student mentors carry out mentoring from the point of view of mentees. For the first to third schools, university student mentors as familiar older members played a major role in helping with emotional and personality-based education by offering counseling and advice on school life. ▲ Special lecture of chef Raymon Kim with aspiring cookers! External mentors are also the strongest assets in Dream Building Creativity School. The top professionals and celebrities in the industry join the school’s programs as part of a talent donation to support young peoples’ dreams. For the fourth school, the actor Ahn Seong-Gi takes on a master mentor role which is like the principal of the school. 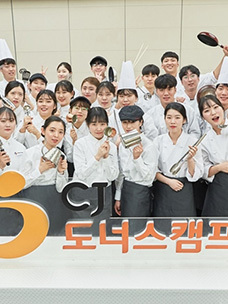 In addition, other mentors working in various sectors are ideal for students interested in related industries: chef Lee Yeon-Bok (cooking), fashion stylist Han Hye-Yeon (fashion), film director Lee Kyung-Mi (film) and musical actor Nam Kyeong-Eup (musical). 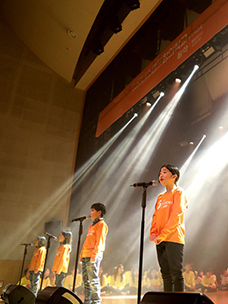 They will lead special classes as well as practical courses, and take charge of judges at Dream Stage, which is a presentation for creative products held in January 2017. As a representative program of CJ Donors Camp, Dream Building Creativity School started to provide training courses in three sectors (music, musical and cooking) to 145 teenagers in 2013. It has since expanded its range of supports every year. As of 2015, more than 500 teens participated in the program to help grow their dreams.